Haywards Heath Town have announced the signings of Kenny Pogue and Cameron Tutt. Striker Pogue joins Heath from Sevenoaks Town where he has scored eight goals this season. Tutt, 17, is a former Brighton and Hove Albion Under 18 player. He played for Heath earlier this season in the 3-0 victory away to Hassocks in the RUR Cup. 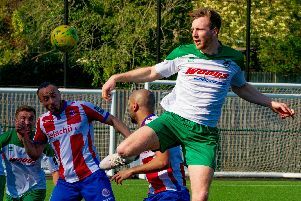 Heath are currently fifth in the Bostik South East but only three points separate them from second-placed Horsham.